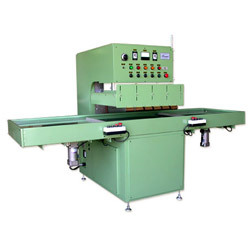 This shuttle table machine is designed for easier operation and for saving space. New oscillation case design; strong, durable and reliable machine. The shuttle table is easy to operate, and can rotate and position accurately. Electrical pre-heat flat mold base loads/unloads molds promptly and supports easy horizontal adjustment. High-sensitivity ARC suppressor features quick response and high stability. May weld PVC or PET-G. suitable for wrap binding, photo album, name card holder, folder, file, blister edge banding and packaging, etc. 1. Max. HF output power: 8KW. 3. Power source: 3P AC220/380/415/440V. 4. Input power: 16 KVA. 6. Distance between upper & lower electrodes: 150 mm. 7. Press stroke (adjustable): 150mm. 8. Dimension of top platen: 550 x 700mm. 10. Press operation: pneumatic type. 11. Packing dimension/weight: 159 x 114 x 190 cm/1360kgs 292 x 98 x 70 cm/360 kgs.